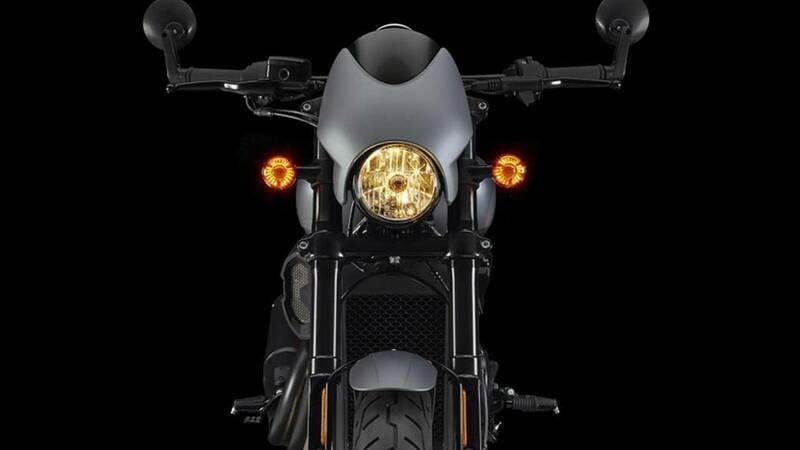 You may remember that when Harley-Davidson's Street 750 first came out, one of the biggest criticisms people had of the bike was that it didn't live up to the Harley standard in terms of fit and finish. It looked cheap – not very well put together. 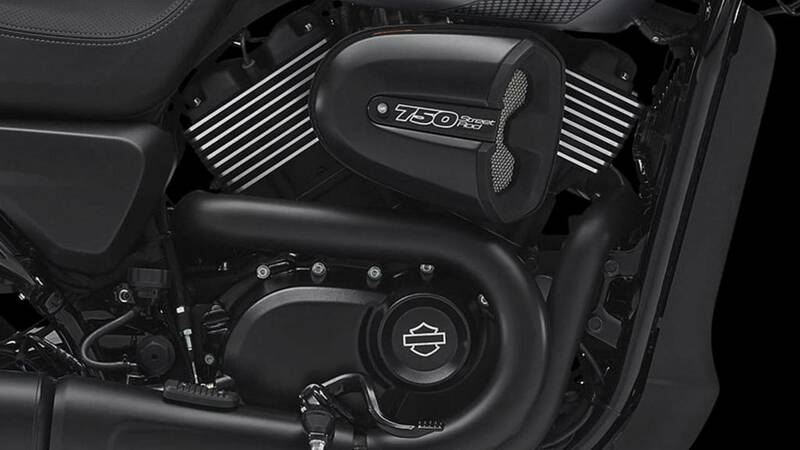 Well, Harley heard you loud and clear and it has fixed that with its all-new Street Rod model. It looks well put together, and it is. This thing is built like a damn tank. I know because I crashed one. 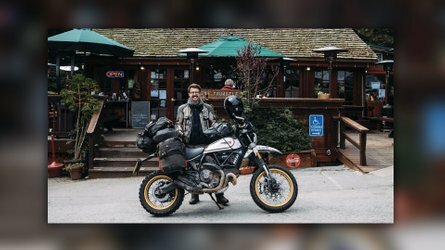 We'll get to that story – and the reason Common Tread's Lemmy and Cycle World's Joseph Gustafson have given me the nickname "Trashcan" – in a moment. But first I want to encourage you to test ride the Street Rod for yourself. This bike represents a new direction for Harley-Davidson and it has something of a mountain to climb in terms of ensuring retail success. The conventional wisdom is that Harley's ever-dwindling core audience will turn their noses up at this new motorcycle, so the 114-year-old company has to reach out to riders that have hitherto been put off by its, ah, conservative reputation. I have a lot of positive things to say about the Street Rod (along with a few criticisms), and I suspect the majority of my peers will as well. But that still may not convince the skeptics. Which is why I say you should ride one. Harley-Davidson has set itself a goal of putting two million additional butts on motorcycle seats over the next decade and one of the ways it plans to do that is through test rides. H-D dealerships want you to come in and throw a leg over, so take them up on the offer. 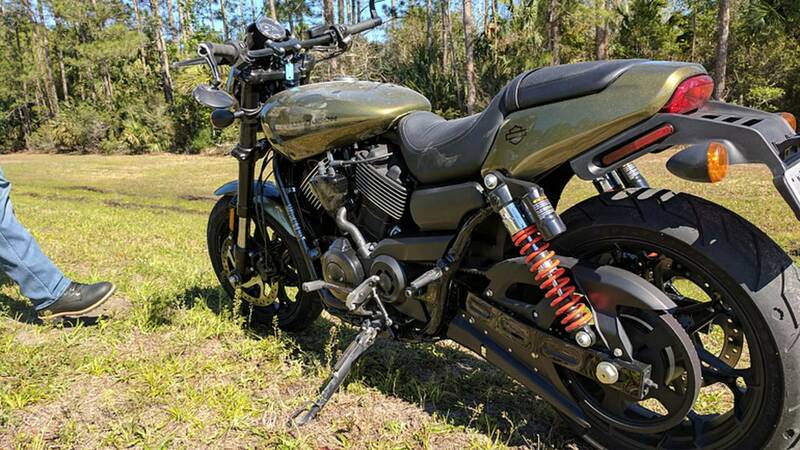 When you do visit that dealership the first thing you'll notice about the Street Rod is that it is, as I say, better looking than the cruiser platform that shares its 750cc liquid-cooled V-twin powerplant. This is something you actually wouldn't mind being seen riding. None of this "built for customization" nonsense; you get good quality and good looks right out of the box. Well, mostly. I'm not a fan of the look of the exhaust. But I suppose we can blame those pesky Europeans for that one. Perhaps more so than Harley's other models the Street Rod is aimed at customers beyond the golden walls of Trumpistan and has been built to meet the very strictest of government regulations. In a post-Euro IV world everybody's got big cans. Despite being built to appease European bureaucrats, the Street Rod maintains a muscular, American aesthetic. 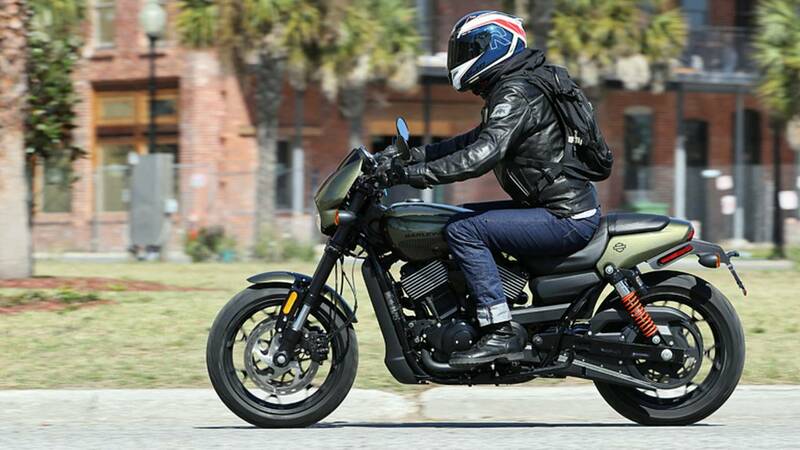 Whereas the Street 750 looks like a Chinese bike that someone slapped a bar and shield decal on, the Street Rod looks like an actual Harley-Davidson. Yes, there are some elements that betray its US $8,699 (£6,745) asking price, but I don't personally feel the compromises are unreasonable. As with any Harley, the engine is the star of the show here. The Revolution X V-twin platform is being put to such good use in this roadster it's hard to imagine it was ever intended for use in a cruiser. Peak torque (47.9 ft lb, or 65 Nm, according to Harley) arrives at 4,000 rpm and peak horsepower (Harley doesn't give those figures, but an educated guess and data from my derriere dyno suggests 60-something horses) comes in just south of 9,000 rpm. Wander a little north of that peak horsepower and you'll bang against the rev limiter, but even high-up in the revs, there's fun to be had. Hitting the rev limiter functioned almost like a quickshifter, allowing me to click up a gear without pulling in the clutch or easing off the throttle. Additionally, it's in these dizzying heights of the rev range that the engine sounds best. I'm inclined to compare the feel of the Street Rod's engine against the Indian Scout Sixty's 1000cc V-twin, and the 900cc parallel twin in the Triumph Street Cup. Of the three, the Street Rod feels the most brutish. We can now see that the Street Rod is (more or less) the bike the Winter Soldier rides in Captain America: Civil War, and that makes sense. This is totally the Harley that an unstoppable assassin with a metal arm would choose. It's an equally good choice for commuters, who will appreciate its drama-free capacity to loll along the highway as well as chug through urban slog. Keeping with the above Street Cup and Scout Sixty comparison, the Street Rod's six-speed transmission is probably the least smooth of the three, but not to any extent that you'll really care. That said, my own experience was that neutral was occasionally difficult to find. 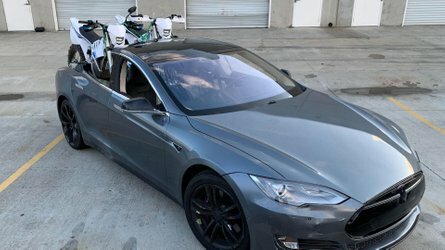 This was exacerbated by the fact the green "N" light on the bike's single clock seems to take a little while to confirm that you have indeed found neutral. I always got there in the end, but worst case scenario, the clutch is light enough I could have just sat through stop light cycles with the lever pulled in. When you go on your own test ride, the first thing you will complain about is the ergonomics. The seating position is very squished, with the rider adopting a baseball catcher's stance – legs splayed open, knees high. Motorcycle.com's John Burns was part of the pack of journalists attending the press ride in Florida and he said that from behind I looked like I was milking a cow. You'll want to make sure you don't have anything in your jeans' front pockets because they will be pulled pretty tight. The riding position was not just an issue for me at 6 foot 1 inch tall, Burns – who is probably 5 to 6 inches shorter than me – also noted that it was a little awkward. But here's the thing: truthfully, you get used to it. In the first five minutes I was using all the profanities I know (and I know quite a lot – I live in Britain, after all), but on my second day with the bike, toward the end of a 157-mile ride, I was downright enjoying myself. 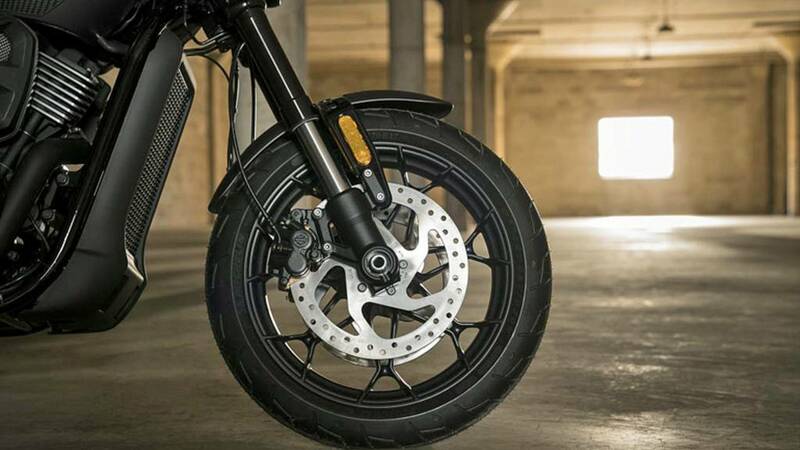 No doubt the fun of the bike's engine helps one to ignore discomfort, but the effectiveness of the suspension, too, plays its part – ensuring that most of the road's unpleasantries are not passed on to the rider. Preload on the rear piggyback shocks can be adjusted with a standard wrench; no need to worry about losing a special tool. The Sunshine State is not known for twisties, but in those corners that I could find the bike was happy to be thrown around. You'll never touch down pegs in normal riding. In spirited, probably-risking-a-license-ban riding, it's likely the exhaust would touch down before the peg, which serves as an incentive to try. Perhaps reflecting its price tag, the Street Rod's brakes are a little off/on. I found it difficult to be nuanced, especially with the rear brake. Doing that "feet up challenge" thing at stop lights was harder than it needed to be. But overall I was happy. I love the dual front discs, both for their look and their effectiveness. ABS comes standard in the European Union; it's available as a worthwhile option in the United States. We learned the hard way that the brakes perform excellently in emergency stops. I mentioned above that Harley took members of the press on a 157-mile route through and around Ocala National Forest in Central Florida. I only completed 135 of those miles. As the press group was zipping along County Road 304 a freak gust of wind blew a 32-gallon trash can into the road, directly into my path. The Street Rod has considerably more ground clearance than any other Harley-Davidson model, but not so much that I was able to completely surmount one of Rubbermaid's fine products at 60 mph. I lowsided, then slid and rolled about 150 feet before ending up in a grassy ditch; the Street Rod continued sliding another 100-150 feet beyond that. After the incident (which I survived with only a few bruises because ATGATT), John Burns, who had been riding directly behind me, said: "I had been looking for an opportunity to test the brakes. Thanks." 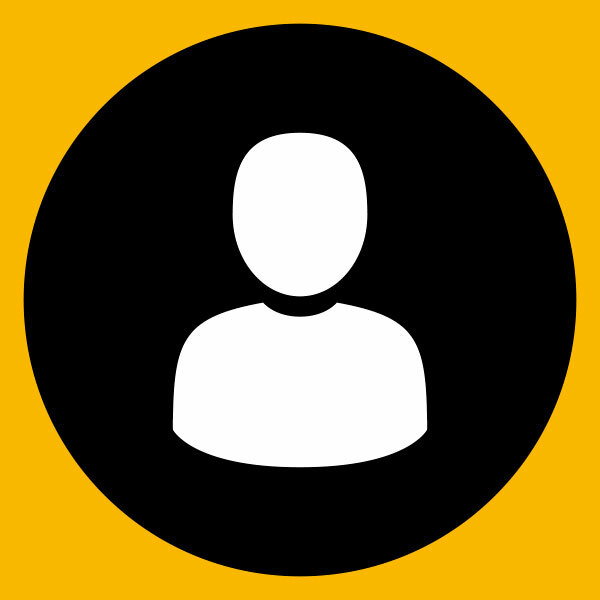 Take a look at the photo above. That's what my bike looked like after the crash. Keen observers will note that it doesn't really look like a motorcycle that has hit an object at 60 mph, then slid some 300 feet across the pavement. Yeah, that mirror's scratched up and the peg's been shredded, but by and large it looks rideable. And, indeed, it was. When Harley-Davidson's chase truck arrived, the bike started on the first try and they were able to ride it onto the truck. So, as I said at the beginning: this thing is built like a damn tank. And I can't help but love it for that. Even if I hadn't been able to put this bike to such an extreme test I would have been inclined to believe it would hold up for a long time. 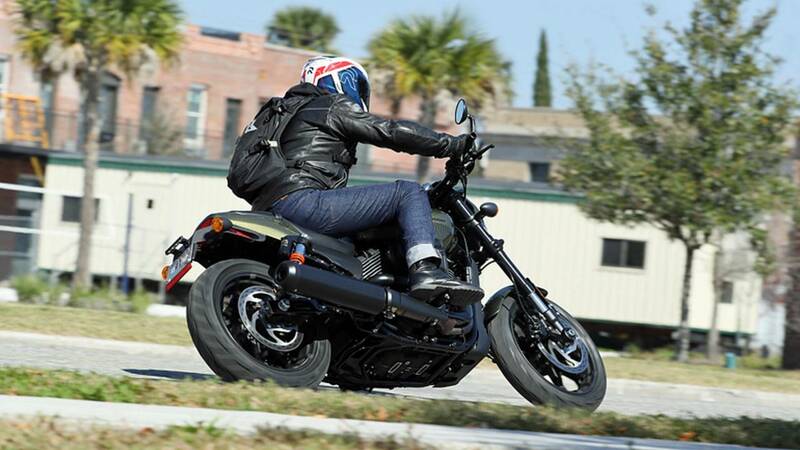 Take a look at forums for issues related to the Street 750 and you'll see that Harley-Davidson has addressed those problems in delivering the Street Rod. The mirrors are good; the brakes are good; there are no particularly ugly welds, or unsightly wires, or plastic badges that look like they came from a goodie bag at a child's birthday party. 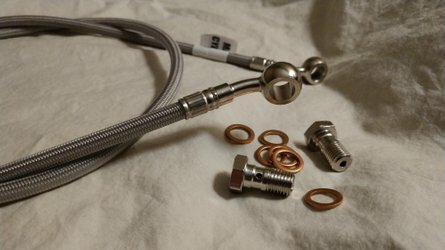 Speaking of goodies, the Street Rod is pretty basic when it comes to technowhizzbangery. ABS is about it. Which is fine. I love gadgetry on bikes, but the pure nature of this roadster means you don't really feel the want of anything. The single clock provides a decent amount of information: an analogue speedometer with a small digital display that can provide odometer, trip meters, gear and rev counter, or time. The button to click through this information is located on the clock, old-school style. 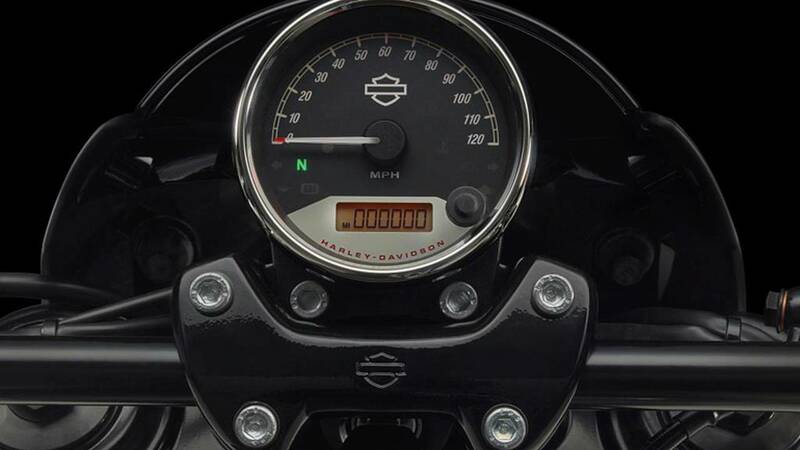 As is my complaint with every Harley-Davidson model, the speedometer numbers are too small. Considering the fact Harley's core audience is older than me, I find it hard to believe I'm the only person who has this complaint. On the plus side, the bike's turn signals are operated by a single switch on the left grip. This is as God intended us to indicate our turns, rather than the usual Harley method of having a button on each grip. Math dummy that I am, I would appreciate a fuel gauge to help me stay alert to how much dino-juice is left in the Street Rod's 3.5 US gallon (13.2 liter) tank. Additionally, I wouldn't complain if said fuel tank were narrower. I suspect the ergonomics of the bike would not irk me so much if my knees weren't both high and wide. If I owned a Street Rod I'd probably invest some time trying to determine whether I could move its pegs a little further back. That, too, would help with ergonomics and it would eliminate the problem of having the pegs be exactly where I wanted to place my legs at a stop. 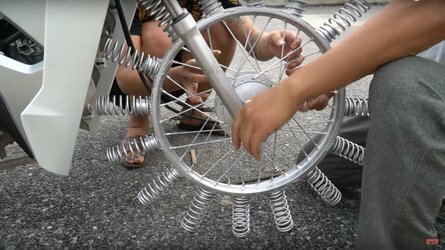 Related to that, if the pegs are going to stay where they are, I'd like to see Harley-Davidson add a spring to prevent riders from accidentally folding them up, as I did on multiple occasions. I would be at a stoplight, it would go green and I would lift my foot to put the bike into gear, but in doing so also fold the peg. Another thing I'd try to do as a Street Rod owner is relocate the exhaust. At present, it sticks out too far. The bike's seat height is roughly 30.4 inches (772 mm), but you'll need to be at least as tall as me to put both feet flat on the ground because the exhaust forces a wide stance. That said, I'm not clever enough to guess where else it could go. 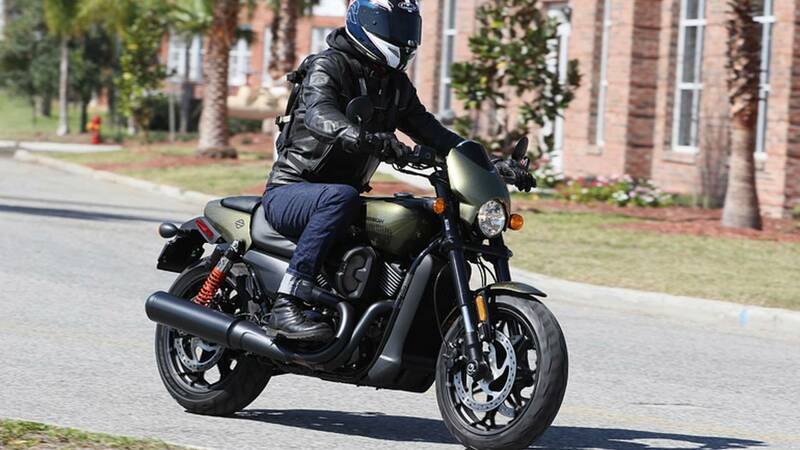 Things like the squished ergonomics, the ugly, sticky-out exhaust, and the Street Rod's weight (524 lbs wet, or 238 kg) will be fodder for those whose hearts are forever hardened against Harley-Davidson. Forget about those dudes. Test ride the bike and decide for yourself. The Street Rod is a motorcycle not without its faults but, importantly, it is a bike that is good enough to exist without caveats. You don't have to adjust your perspective to assess this bike. You don't have to say something like: "This is a really good motorcycle, you know, for a Harley..."
Scratch the name off the tank (if you can; there was only minor paint damage on the one I slid down a highway) and it is a bike that can hold its own price- and performance-wise against American, European, and Japanese competitors. 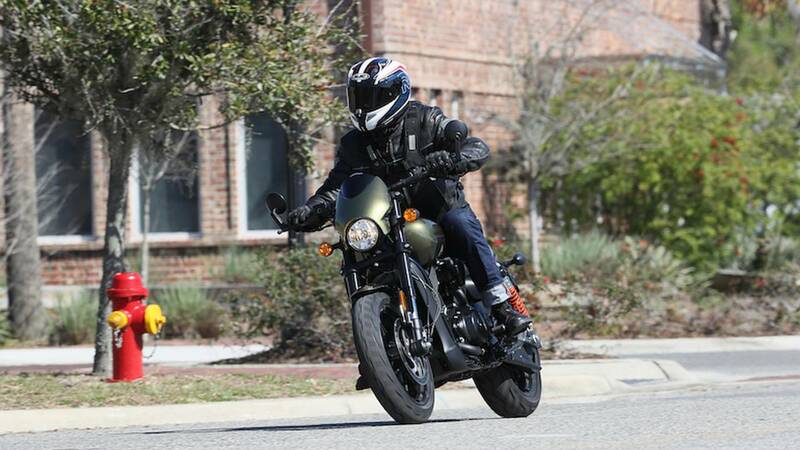 It has better fit and finish than a Yamaha XSR700; its engine has more bad-assitude than a Triumph Street Cup; it handles better than an Indian Scout Sixty. And so on and so on. After that, you can add the fact that, yeah, it is a Harley-Davidson. 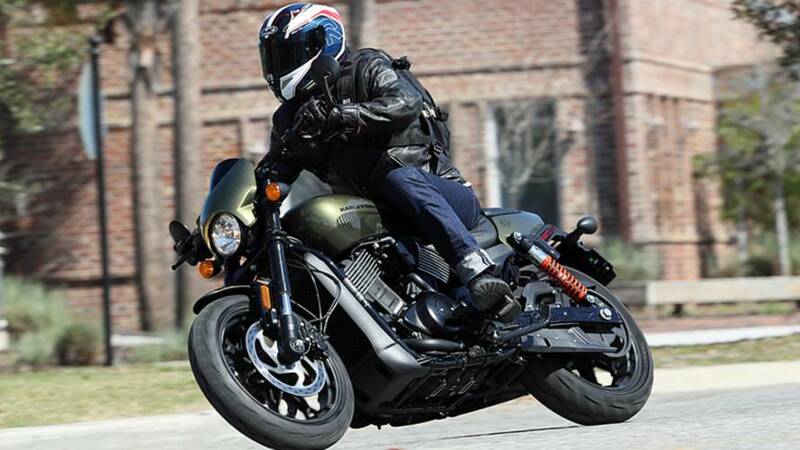 It is a real Harley-Davidson; a bike that looks and feels like a natural part of the company's ethos. Lemmy has said he will be surprised and disappointed if this model does not perform well. I will be, too. This is the bike people have been asking for. Meanwhile, Indian Motorcycle should definitely be concerned. It seems the resurrection of its old rival has reinvigorated Harley-Davidson and it is landing a big punch with a bike like this. The boys and girls in Milwaukee have promised to deliver 50 new models over the next five years – the Street Rod being one of the first. Goodness knows what else they've got up their sleeve. Riding Experience: Usually upright. Sometimes less so.